Originally an iOS game released back in September of 2015, Bridge Constructor Stunts was a follow-up to the popular Bridge Constructor series. The first physics-based puzzle game wasn’t originally a mobile title, even though the series has gained a strong foothold in the Android and iOS market. In March 2014 Bridge Constructor took off after a a Reddit user posted a gif from the game showing a truck barely making it across a collapsing bridge. Why the history lesson? 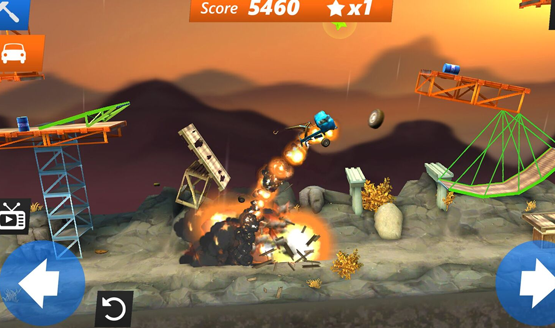 Bridge Constructor Stunts was the fourth game in the series, first released for iOS, then Android in 2015, it was followed by staggered PC and Xbox One releases in 2016. Finally, in 2018, we got the PS4 version of the game. One might think that in the three years since its iOS release, Headup Games might have done a little work to improve the mobile version for consoles. Take a look at the original iOS release trailer and you’ll see an identical game to the version released three years later on PS4. The UI, graphics, and even levels are virtually unchanged from the freemium version you can get on mobile. There’s a visceral satisfaction to physics-based games. Watching a dump truck do four full flips through the air after driving over a precariously built ramp is addicting, but it’s better served as a mobile title. Instead of building simple bridges, you’ll be constructing ramps to jump two vehicles–a tow truck and a dump truck–with increasing limitations and difficulty in each subsequent level. There’s a visceral satisfaction to physics-based games. Watching a dump truck do four full flips through the air after driving over a precariously built ramp is addicting, but it’s better served as a mobile title. The task is often just to reach the checkered flag at the finish line, though occasionally you’ll be required to do a flip or collect some floating stars in order to pass the level. None of the requirements ever get too difficult to handle, though there are collectible golden bolts in almost every level that provide some modicum of additional challenge. Two different vehicles will test players, but neither felt all that different from the other. The dump truck was a bit heavier and longer but it didn’t ever require radically different ways of thinking about the puzzles. Building ramps and bridges with a controller is tedious work. It’s something that strikes me as far easier with a touch screen, or even a mouse and keyboard, but it seems like few considerations were made for the controller. Erecting a complex structure takes a lot of time, with moving critical points mapped to holding down X, and building new objects mapped to tapping X. There are 17 buttons on a DualShock 4 that could possibly have controls mapped to them. Many of those buttons go unused, and yet, two critical controls get mapped to the same button. I get that they were trying to go for the same feel that touch controls might offer, but this is a console game. Well, it’s a mobile game blown up to a 47-inch TV screen with no attentiveness to the displacement. Another major problem that could have been solved through some reworking of controls for consoles is snapping or not snapping to the nearest critical point. Often I would try to connect a truss to an existing point, but would miss by a small amount, sometimes so small that the two white dots were not discernible from one another. When I would attempt to test the structural integrity of my ramps and bridges, that joint would pop out and my structure would collapse. It would have been easy to allow for a button press to snap the cursor to the nearest joint to ensure the entire structure was actually bolted together. All said, the puzzles are pretty fun to figure out at the start, though far less varied than those in Bridge Constructor Portal (there are also far fewer of them). Puzzle limitations rely on arbitrary red-lined areas where you can’t build anything, unlike Portal’s limitations being based on lasers and objects that make sense within the world. I was happy that Stunts had a limit set on how much you could build though. Solutions couldn’t be strong armed by overbuilding ridiculous structures. Ramps and bridges had to be carefully built to work within the building limits, meaning that there were distinct puzzle solutions. Even though there are fewer puzzles overall, with much less variance, they get boring far more quickly than Bridge Constructor Portal. The comparisons to Bridge Constructor Portal are a little unfair. Stunts technically released before Portal did, however the ordering of the PS4 releases would easily create the illusion that an inferior game followed one that was rather fun and polished, if a little flawed. Pricing is far from attractive, too. Bridge Constructor Stunts runs $9.99 on PS4 for a game that is hardly changed or expanded from the mobile release. The mobile game, on the other hand, is free with ads, or $1.99 for the paid version without ads. I’m in no way a game developer, but I can’t imagine the 500% increase to be justified by the port to consoles. Bridge Constructor Stunts is a mobile game that’s been ported to just about every platform under the sun. Its 2018 PS4 release is little more than a big screen version of the freemium game that came out on iOS back in 2015. There’s an element of fun here, but it’s hardly the type of game people bought their PS4s to play. If you’ve got an inkling of interest in the Bridge Constructor series, might I recommend trying the series for free on mobile, or even the far superior Bridge Constructor Portal? 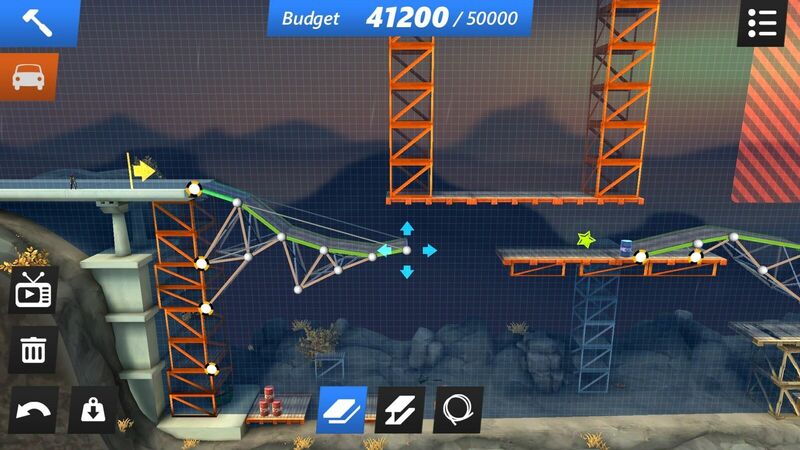 Bridge Constructor Stunts for PS4 just ends up landing on its head. 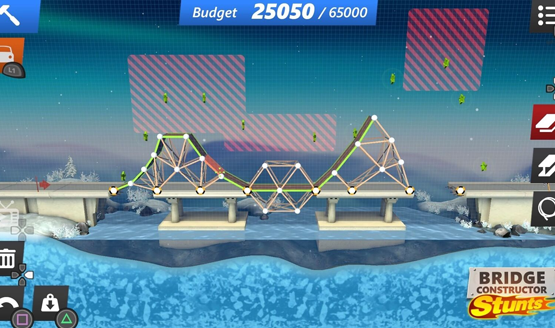 Bridge Constructor Stunts review code provided by the publisher. Version 1.00 reviewed on a standard PS4. For more information on scoring, please read our Review Policy.